With the sound of her horns, Elandess pointed her bow north on the Weser River in Germany, departing Abeking & Rasmussen on her delivery journey. It marked the end of what was approximately a three-year build project. The first glimpses of Elandess, measuring 244 feet (74.5 meters), occurred last summer. Though she was still bare metal, as hull 6502, elements of her styling shone through. For one, she has a slim, vertical bow, which Abeking & Rasmussen terms an Atlantic bow. The design, common on historic German battleships, improves seakeeping. In addition, it keeps the foredeck drier. These two benefits come from a combination of things. One is higher than usual freeboard. The other is a pushed-forward deck level where the bow intersects the waterline. Harrison Eidsgaard also worked with the owner for the interior design and space arrangement. Few facts are public, but the megayacht does have accommodations for 12 in the owner’s party. Naturally, the master suite sits forward on the main deck, taking advantage of expansive views. Guests can enjoy expansive views, too, thanks to an observation lounge on the upper deck. Elandess has floor-to-ceiling glass here, making for quite the experience. Overall, the floor plan is open, to heighten the voluminous feel. When the owner and guests want to relax out on deck, they have plenty of settees from which to choose, plus a pool. The pool stretches 26 feet long (8 meters long) on the aft main deck. The current Elandess is a successor to a same-named superyacht, also from Abeking & Rasmussen. That Elandess, measuring 197 feet (60 meters), launched in 2009. Interestingly, she, too, was a successor. 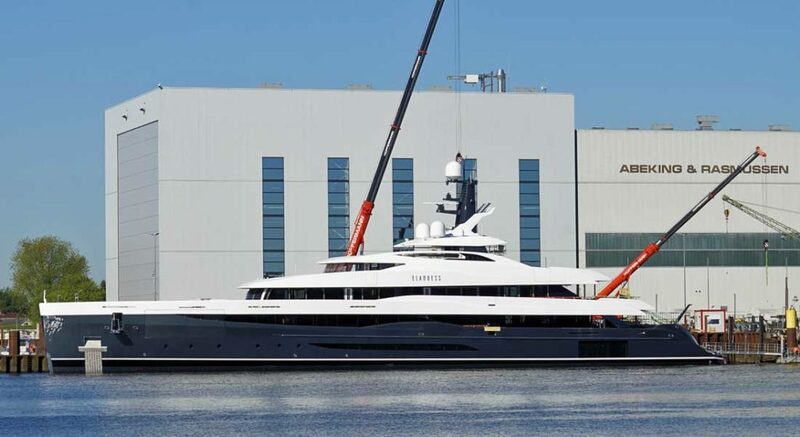 The owner had a 154-footer (47-meter) from Heesen in 2008. The newly delivered yacht is currently in Norwegian waters. Here’s her departure over the weekend.